This high-performance iron delivers professional results by featuring a powerful steam rate that blasts through wrinkles quickly and effectively. The 10-foot cord offers convenient mobility, the heavy-duty stainless steel soleplate provides smooth glide and high durability, and the separate steam and temperature controls let you customize settings for all types of fabrics. Plus, the 3-way auto-shutoff feature gives peace of mind with every use. Noted for its ability to smoothly glide across all fabric types, this soleplate material delivers high durability and resistance to scratching along with long-term satisfaction. Customize settings independently for versatility. 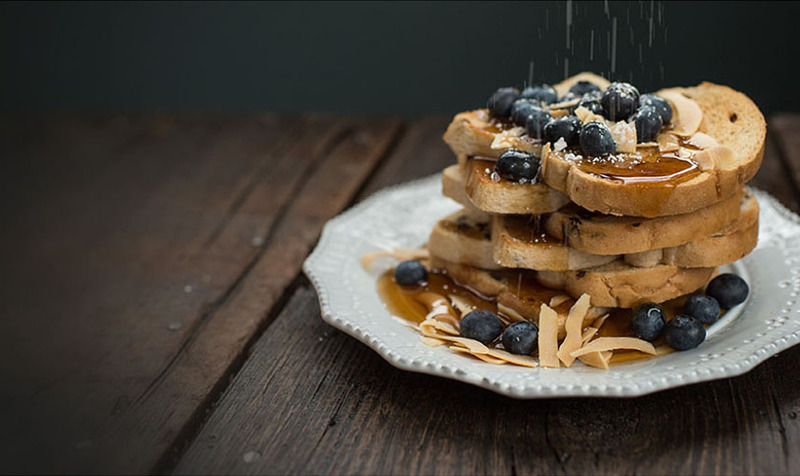 The temperature control dial features recommended steam level settings for helpful guidance. 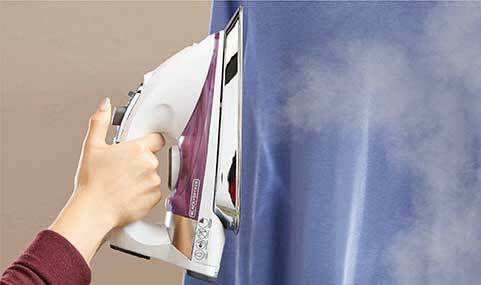 Blast away tough wrinkles with steam surge, which also works vertically for steaming curtains & clothes on the hanger. The clear-view water tank lets you see when the iron needs a refill. 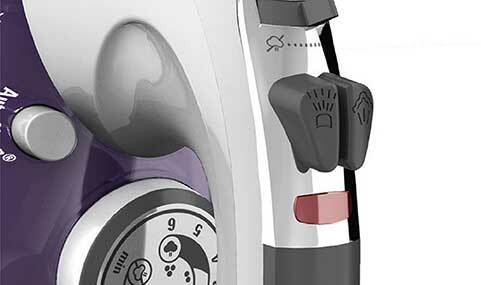 Professional Steam Iron with Stainless Steel Soleplate, Purple is rated 3.5 out of 5 by 43. Rated 3 out of 5 by Roech from Great While It Lasted!! I bought this iron 6 months ago and it was actually a good one for the price. I really had no complaints until I plugged it in and it wasn't heating. Make sure you keep your proof of purchase. I did not so I have no proof to show for warranty purposes. 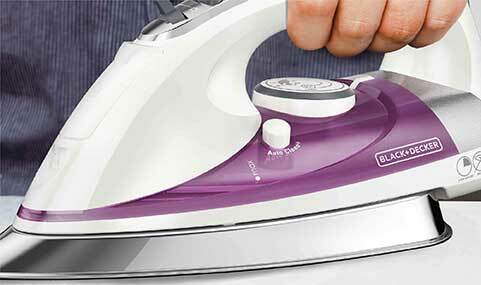 Rated 5 out of 5 by Kris10 from Love this iron My husband wears dress clothes to work daily. I wear jeans. I needed a new uron after our put a nice brown spot on his favorite shirt. This is was amazing, it slid right over the fsbic like air. It was even temperature and the steam feature worked great! I would recommend getting this iron!!! It does save time! Rated 2 out of 5 by smoothyp from leaker Brought home from store and went to use it it was leaking so bad. I am turning around now and taking it back. Had water all over my clothes that i was ironing. Rated 2 out of 5 by Retiredrita from Returning iron I purchased this iron four days. Going to return tomorrow. I have no idea if it works well or not I did not use it. Fabric dial is numerical which does not tell me what each number represents (fabric wise). That is terrible. I need to know what number is for cotton, silk, polyester, etc. my old iron was a B&D and it showed on the iron what each number represents. Rated 4 out of 5 by ironman from worked well for a while, but no heat now I've had this iron for several years, worked well during that time, but plugged it in tonight and not heat. Never dropped, used the auto clean regularly, and generally taken care of. Disappointed in the short lifespan. Rated 3 out of 5 by ekonop from Iron is not heavy It seems like I have had trouble with this iron since I bought it. It leaks from the soleplate and leaves water marks on clothing. Now it also leaves tiny little black spots. I have the manual which indicates that this iron has a two-year warranty. I purchased this iron on December 5, 2015. I find your website very confusing. What must I do to get a replacement iron? How do I open the lid to fill the water tank? Please help me to identified this fabric, what is Satin fabric classify as silk, cotton or what? Thank you very much for your assistance.